BLOG: Does optometry have a ‘student problem’? Scott A. Edmonds, OD, FAAO, focuses his blog on the role of the optometrist in health care reform – moving from primary eye care to primary health care. He is the chief medical officer of MARCH Vision Care, the co-director of the Low Vision/Contact Lens Service at Wills Eye Institute in Philadelphia and a member of the Primary Care Optometry News Editorial Board. Disclosure: Edmonds is a consultant for March Vision. I have noted a recent trend in our literature and publications that refers to a “student problem.” Apparently, some of our leaders think that we have an oversupply of both optometry schools and new graduates. I have asked my lifelong friend and classmate to assist me in addressing this topic for this blog. Dr. Richard Edlow is not only an optometrist, but also an “eyeconomist.” Long-term chair of the Information and Data Committee for the American Optometric Association, Richard is a noted expert in this field. From my perspective, optometry is a primary care profession. As such, many of us have broadened our scope and become involved with the overall health and welfare of our patients. Our EHRs have required vital signs since 2011, and we have used this data to educate, counsel and refer patients who are at risk of developing chronic medical problems. A recent article by the Association of American Medical Colleges quotes new research that predicts a shortage approaching 120,000 doctors by the year 2030. In my experience as a consultant and member of the Accreditation Council on Optometric Education, I found that schools and colleges of optometry do an outstanding job in training our new graduates. All programs, new and old alike, are held to the same rigorous standards, and the council extensively studies each program, performing site visits and extensive interviews with faculty, students and all stakeholders. The problems with the board scores, which is often mentioned when discussing optometry students, is not a student problem, but related to different curriculum at each institution being disconnected to the newly revised and highly secretive body of testing protocols that has been designed by the independent and autonomous National Board of Examiners in Optometry. This is not just a problem with the new schools and colleges, as some of the oldest and well-established programs are also producing students that are struggling with the new examinations. While the increase in new graduates might be cause for concern, there are some very encouraging trends that should mitigate the fear of too many practicing optometrists. One must not look at optometry as a specialty silo but, instead, as one of the components of the entire eye care delivery system in the U.S. From the proverbial 30,000-foot level, it is best to analyze overall demand for eye care services and the supply of providers, i.e., basic supply and demand dynamics. 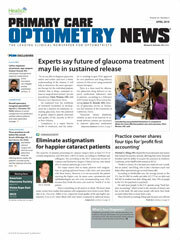 First, let’s take a look at the future demand for eye care services. We have hard data from Medicare (CMS) as to the number of services provided to fee-for-service Medicare recipients in 2015. From that data – the comparable data for the Medicare Advantage population and historic utilization rates for services in both the commercial insurance population (age 64 years and younger) and the Medicare population (65 year and older) – we can very accurately predict the future demand for medical eye care services. The utilization rates are then combined with the U.S. Census Bureau estimates for the U.S. population, by age category, in 2025. Based on this data, we can very comfortably predict that in the year 2025 demand for medical eye care services will be 16.3 million visits per year greater than it was in 2015. The demand for routine comprehensive exams will also increase, but by a lesser amount, 3.5 million more exams per year. Comparing the demand for office-based eye exams from 2015 to 2025, we collectively need to deliver just shy of 20 million additional eye exams per year. Aside from increased demand for diagnostic testing (11 million more procedures per year), glaucoma surgical procedures and intravitreal injections, it is projected that the U.S. eye care delivery system will need to perform 1.5 million additional cataract surgeries per year. The general consensus is that the average ophthalmologist performs 400 cataract procedures per year (obviously, some perform thousands per year and others just 100 to 200 per year). So, for just cataract surgery alone, we need an additional 3,750 ophthalmologists from the current 2015 level to 2025. The challenge for our eye care delivery system is that the supply of ophthalmologists from 2015 to 2025 will only increase by 436 over the entire 10-year period. On average, only 465 will complete the residency program each year as 423 practitioners exit (retirement, death, etc.). Apply calculations for full-time equivalents (FTEs), and the number of new FTE ophthalmologists over this time period will only increase by 301. That is 30 new FTE ophthalmologists each year over the 10-year period. This number not only falls far short of what is needed for just cataract surgery but is expected to create a serious void in delivering care for age-related eye diseases. During this same period, it is anticipated that the net increase in FTE optometrists will be 5,943 or approximately 594 new FTE doctors per year. It is this increase in newly trained optometrists who will fill the void created by the serious imbalance between the increased demand for age-related eye care services and the relatively flat labor supply of ophthalmologists. In conclusion, we feel that optometry does not have a student problem. The strength of optometry is in our numbers. High numbers of providers correlates to more access to primary care services, and this is exactly what is needed to improve the health of America. The problem is the narrow and outdated view of optometry that limits us to routine eye examinations and as vendors of eyeglasses and contact lens. When viewed though this lens, as seems to be the case with some outspoken leaders in our profession, it may seem like we have an oversupply. But when viewed in the context of needed low vision care for the aging Baby Boomers; rehabilitation for concussion, brain injury and the host of neurologic problems that result in vision problems; filling the void for the shrinking number of ophthalmologists; and our expansion into true primary care services, we are part of a dramatic shortage of health care providers. We agree that we need to fix the “disconnect” between the schools and the national board and we need to train and test our new optometrists to meet the broadening need for our service. What we don't need is for our leaders to sit around and complain about why things aren’t the same as in the “good ol’ days.” The brightest days for optometry are still ahead of us. Association of American Medical Colleges. New research shows increasing physician shortages in both primary and specialty care. Posted April 11, 2018. Office of Disease Prevention and Health Promotion. HealthyPeople.gov. Access to health services. Accessed May 14, 2018.